With winter still in full swing, snow remains abundant all over Russia and it stays for a good three months for us to enjoy! CREF would like to take you on a journey, in Russian, through all different activities (развлече́ния – razvléchénia) and games (ви́ды спо́рта – vidy sporta) associated with snow (снег – sniég) and ice (лëд – liod). Snow can provide entertainment for all budgets, as long as one is wearing clothes that are waterproof (непромока́емые – nipramakayémy) and warm (тëплые – tioply)! It’s also an excuse to indulge in some sports activities in the form of games, which are ideal for the entire family (для всей семи́ – dlia vsiéï semi). It’s a perfect time to engage in a snowball fight (играть в снежки́ – igrat v snézhki), which is excellent for developing one’s agility (ло́вкость – lovkost), speed (быстрота́ – bystrata), balance (равнове́сие – ravnavéssié) and the zygomatic muscles (скулавы́е мы́шцы – skoulavyé myjtsy). 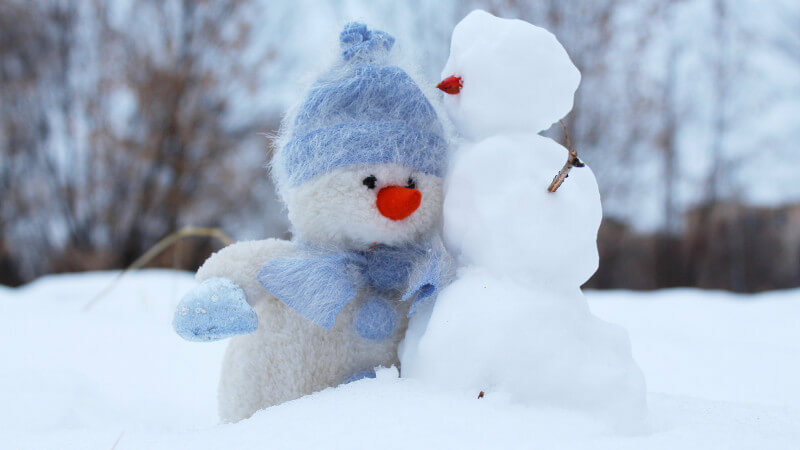 Then, after having calmed down (успоко́иться – ouspakoïtsa) and made peace (помири́ться – pamiritsa), one can roll together three balls of snow to make a snowman (снегови́к – sniégavik), which is also sometimes called the « snowlady» (сне́жная ба́ба – sniejnaya baba); building with snow develops not only one’s concentration (сосредото́чение – sasrédatochénié) and focus (внима́ние – vnimanié), but also one’s knowledge of the physical properties (физи́ческие ка́чества – fisitcheskié katchestva) of snow. Of course, not all temperatures are suitable for snow to stay together. Ideally, temperatures should be somewhere between -1 (оди́н гра́дус мороза – adin gradous maroza) and 1 (один гра́дус тепла́ – adin gradous tipla) degree Celsius. This is a wonderful coincidence, since one can spend more time outside (на у́лице) in such temperatures, compared to when it’s -10. There are many variations of the snowman, depending on people’s tastes. Some adorn it with an old hat (ста́рая ша́пка – staraya chapka) while others draw red cheeks on it with gouache (гуаш – gouache), with a carrot (морковь – markov ‘) for the nose. To make sure the snowman lasts, some spray it with water (брызгнуть водой – bryzgnout vodoï), turning its skin into ice (лëд-liod) … we mean the snowy outer surface of the snowman! If temperatures permit, there are also other ways to have fun with snow: why not make a castle (за́мок – zamak), like how it’s done with sand at the beach? Or an igloo (ледяна́я хи́жина – lidénaya khizhina)? Perhaps a fortress (кре́пость – krepast’) to prepare for a largescale snowball fight? One can also visit and admire the ice sculptures (ледяны́е скульпту́ры – lidiniyé skoulptoury) that are on display in all the big cities. But one of the biggest highlights during the winter is going for a sled run (спуск на са́нках – spousk na sankakh). The sled comes in many forms, from saucer shape to one that is inflatable. The sled-stroller (са́нки-коля́ска – sanki-kaliaska) is normally given to children by parents who can then push it from behind. Some models come with retractable wheels to effortlessly move over pavement as well. But these are not built for slopes (для спу́сков – dlia spousskov). The sleigh-sled (снегока́т – sniégakat) with skids and a steering wheel (снегокат – sniégakat), is for more sporty types (ages four and above); it competes for users with the classic sled, which is normally made of wood or metal (санки – sanki, always plural). Of course, one must accept that the tube or “tubing” (тюбинг – tioubing) has become much more popular. It is ubiquitous in parks. It’s got stability (стаби́льность – stabil’nost’), damping (амортиза́ция – amartizatsia) and speed (ско́рость – skorost’), even if it can be more cumbersome and even heavier (тяжëлая – tizholaya) than traditional sleds. Doesn’t the simple plastic shape of the saucer (ледянка – lédianka or тарелка – tariélka) cause as much uncontrolled laughter (безудержный смех – biézouderzhnyi smekh) as it does the act of falling and tumbling (падения – padienia)? Other forms of entertainment require some investment (вложе́ние – vlazhénié). Take a stroll through a park and you are like to encounter people wearing appropriately sporty shoes and using walking sticks, which are referred to as Scandinavian walking sticks (па́лки для скандина́вской ходьбы́ – palki dlia scandinavskoï khad’by); others might be sporting cross-country skis (лы́жи – lyzhy), which requires a smaller budget than does alpine skiing (горные лыжи – gornyé lyjy). It has been perfectly adapted to the winter season in Moscow thanks to the measures taken by the city’s many parks. The routes are free (беспла́тные – biezplatnyé) and can cover tens of kilometers. Be careful not to get lost! Virtually all the outlying districts of major Russian cities have one or more “boxes” (коро́бка – karobka). This is a field that is used for football on sunny days and ice hockey (хокке́й – khakeï) in winter. Many people go for a walk with their ice skates (коньки́ – kan’ki) in tow so as to use one of the many free rinks (катки́ – katki, singulier като́к – katok) present throughout the city. You can also rent (взять напрокат – vziat naprakat’) a pair of skates on site and enjoy the huge outdoor ice rinks at Gorky Park or VDNKh, for example. If you don’t know how to skate, don’t worry, you are not alone. Contrary to what you might have heard, many Russians are not born wearing skates! You will therefore see other beginners (начина́ющие – natchinayoushié), such as yourself, on the slopes. In any case, be careful and protect yourself in case you fall! Finally, why not practice your Russian by writing words in the snow? As the CREF teachers always like to say, seize every opportunity to practice!